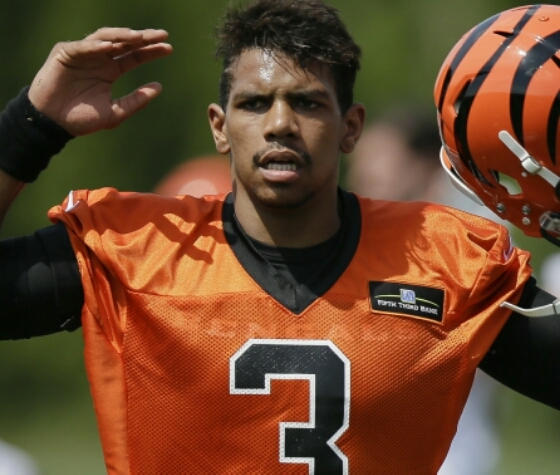 Raiders/Bengals QB Pryor Sign With Browns As WR | "IT'S A STEELERS WORLD"! How funny is this? First they start off with the train wreck known as, Johnny Manziel. Now they believe former quarterback Terrelle Pryor will their answer at wide receiver to their continued placement at the bottom of the NFL. According to Mike Florio of Pro Football Talk, former Oakland Raiders and Cincinnati Bengals quarterback, Terrelle Pryor will remain in the AFC North, having been claimed off waivers by the Browns. Pryor, who turned 26 on Saturday, has appeared in 15 games – all with the Raiders – since his NFL career began in 2011, combining for 12 touchdowns (nine passing, three rushing) and 12 interceptions. After he was waived by the Bengals last week, however, Pryor decided to make the transition from quarterback to wide receiver, according to agent Drew Rosenhaus. The Browns claimed Pryor with an eye on trying him exclusively at wide receiver. While the team doesn’t exactly have a stable quarterback situation, the same can be said of the wide receiver position, where Josh Gordon is set to miss the entire 2015 season due to a suspension. “Good luck with that Cleveland. I’m sure that Pryor will make an excellent addition to your already losing record. Because coming from Oakland, he should be used to it”. ← BLINDSIDE OHER TO RAVENS OHER: “Get Over It”!